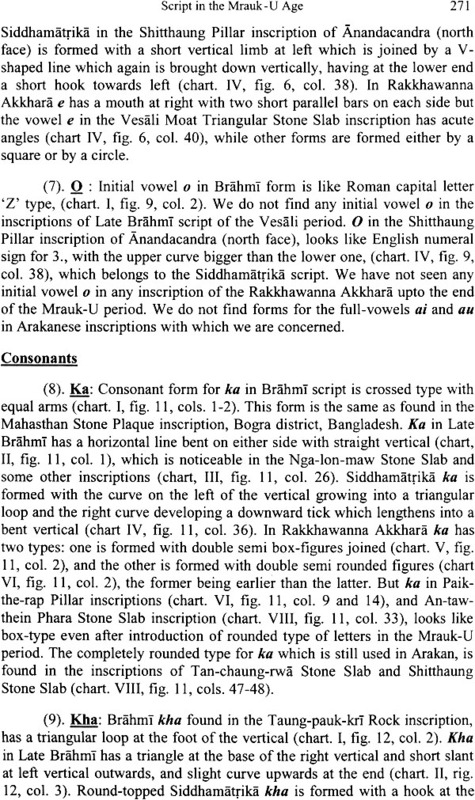 In 1913 the renowned scholar R. D. Banerji was awarded the Jubilee Research Prize of Calcutta University for his dissertation ‘The Origin of The Bengali Script’. About 100 years later, almost coincidentally, Prof. Dr. Amitabha Bhattacharyya, grandson- in-law of Prof. R. D. Banerji supervised the research work ‘Origin and Development of Arakanese script’ by U. Sandamuni for which the latter was awarded the Ph.D. Degree of Calcutta University. 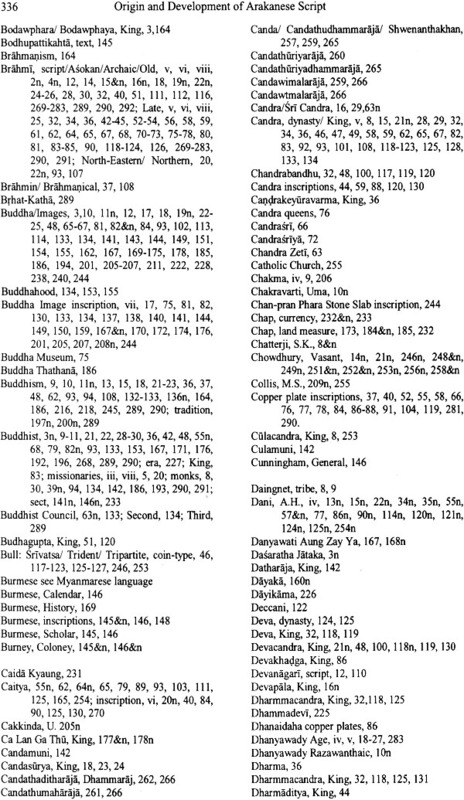 Divided into eight chapters the thesis demonstrated Arakanese script from the earliest time to present day in twenty seven highly invaluable charts. Originally containing two hundred twenty four plates as part of the 2nd volume of the thesis when it was submitted in anticipation of the Ph.D. Degree, the present book illustrates eighty seven representative plates. 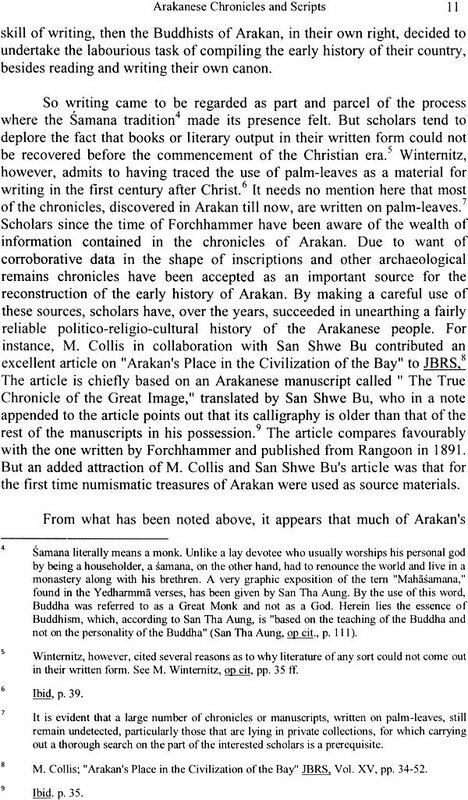 The present treatise is the outcome of more than five years continuous hard work-mostly long tours across Myanmar’s provincial state of Arakan (Rakhine) in search of inscribed materials of any make, relevant to the unravelling of the mystery of Arakan’s most ancient script. With this end in view I got myself enrolled as a Ph.D. student under the supervision of Prof. Dr. Amitabha Bhattacharyya in the Department of Ancient Indian History and Culture, University of Calcutta. When I finally submitted the thesis in the year 2003 I heaved a sigh of relief and after about two years in 2005 I was awarded the Doctorate Degree. Since then much water has flowed down the mighty Ganges. 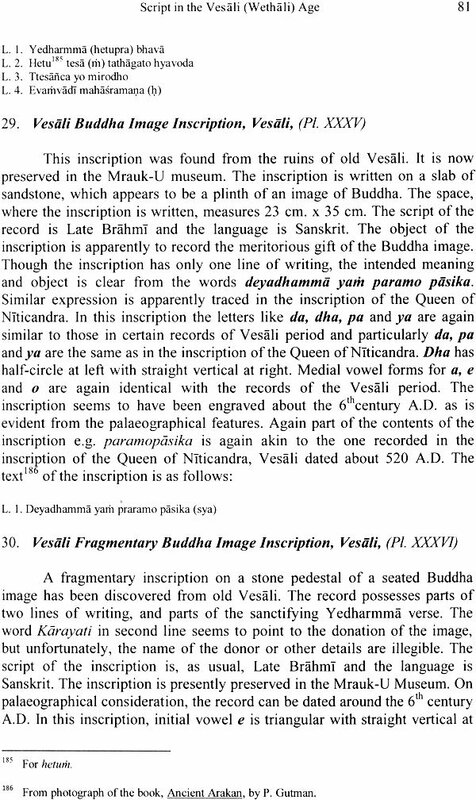 Owing to manifold monastic obligations in Bodh Gaya where I am settled, I could not find time to do justice to the dissertation that rewarded me with the Ph. D. Degree. At last towards the end of 2012 I somehow got some relief from my preoccupations and decided to publish the thesis in co-operation with a few of my well-wishers in Kolkata. Meanwhile the dissertation was thoroughly revised and made ready for the press to publish it. In this endeavour I received assistance from various quarters. The computer type-setting of the book was ably taken care of by Mr. Debasish Chakraborty and Mr. Asit Chakraborty. Mr. Koushik Sharmadhikari arranged the plates efficiently and he also helped me in other computer-related works. The indexes have been prepared by Mr. Rajibkanti Sarmadhikari. Mr. D.L.S. Jayawardana of Maha Bodhi Book Agency and Mr. Dilip Roy of Sagarika Press, Kolkata took the onerous responsibility of bringing out the book in print. To all of them I owe deep debt of gratitude. A look at any standard atlas of South-East Asia would show that Arakan, presently a province of Myanmar (Burma) state, is surrounded on the south-west by the Bay of Bengal, on the east by central Myanmar, on the west and north-west by Bangladesh and on the north by Indian state of Mizoram, and by Chin, a province of Myanmar, bordering India. It may be noted that previously the territory, now in Chin was included within Arakan. During the Prime Ministership of U Nu, however, Palakwa area was severed from Arakan. Needless to say that the above geographical situation makes Arakan, from a hoary antiquity, a meeting ground of at least two dominant cultures - those of India and China. Presently, the ethnic features of the people of Arakan lean heavily on the side of the Mongolian or brachycephalic short Mongoloid type. Still there are traces of contact with people who were basically Indo-Aryan, and who came from the eastern parts of India. 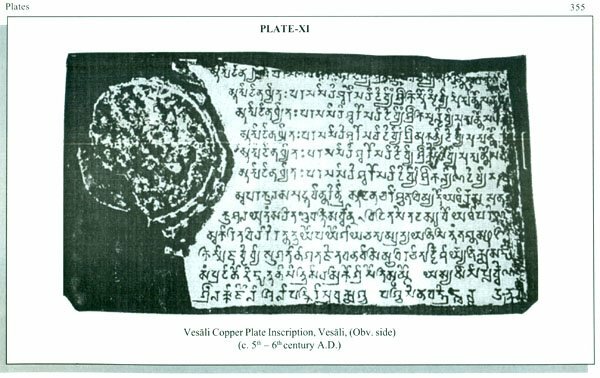 A clearer picture emerges from about the middle of fourth century A.D. when three states not far away from Arakan had been referred to as Samatata, Davaka and Kamarupa in the Allahabad Prasasti of Samudragupta, the Gupta king of Northern India. 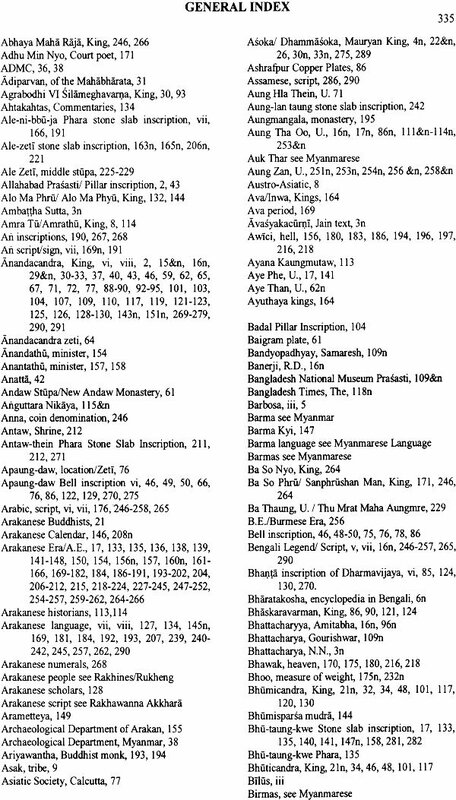 According to the description given in the Allahabad Prasasti Samatata, Davaka and Kamarupa were frontier states (Pratyanta) of the empire of Samudragupta. All these states had autonomy; they used to pay tributes and taxes to the Gupta emperor. 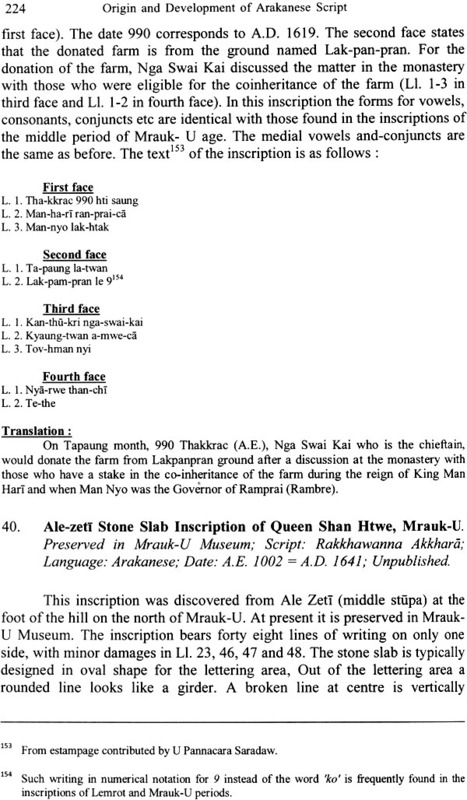 So by the fourth century A.D. if nearby regions lying to the west of Arakan had autonomous kingdoms, there is good ground to suppose that by this time Arakan also had a settled form of government - a valid proposition on grounds of evidence furnished by the Shitthaung Prasasti of King Anandacandra of Arakan. 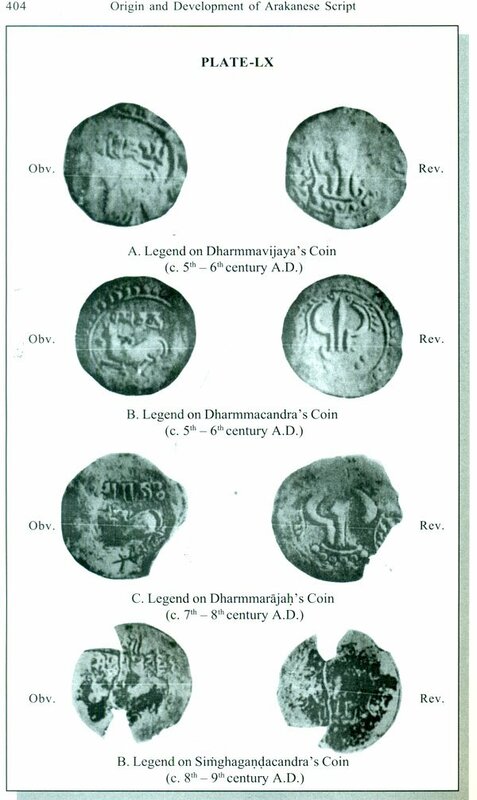 The connection with Samatata region, which in early medieval times came to be known as Harikela, has been illustrated with the find of a large number of coins in Harikela region as well as in Arakan. 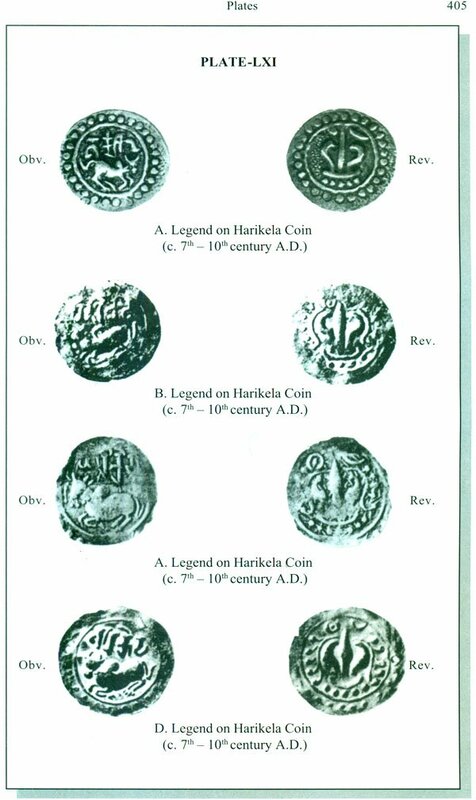 The series of Harikela coins in silver continued to be issued in the Harikela region from the 7th century to at least 12th-13th century A.D. 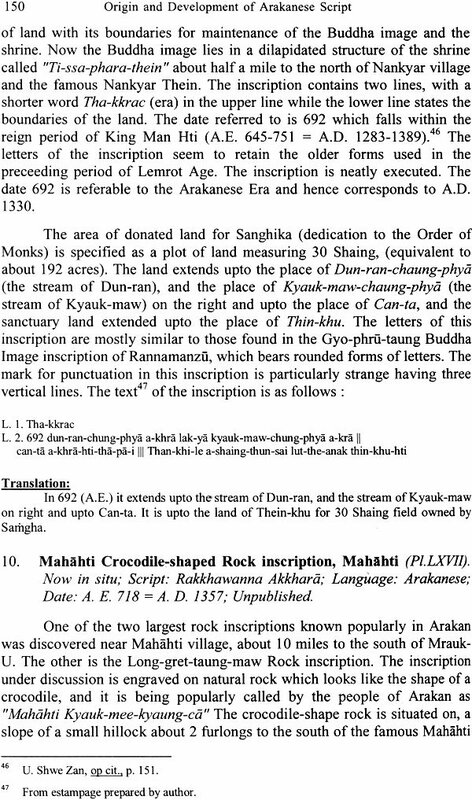 The Harikela coins found in Arakan bear legends datable to about the 6th century A.D. Palaeographical features, however, indicate that the earliest datable inscription of Arakan belonged to about the 2nd century B.C. 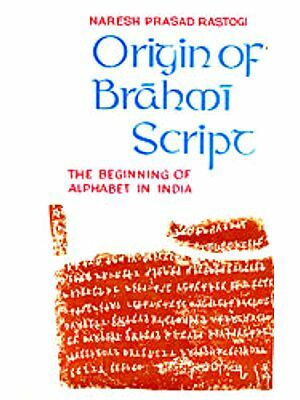 and is written in Old Brahmi and Pali language. This period in early Arakanese history coincides with the rule of the kings of Surya dynasty of the third Dhanyawady period of Arakan. 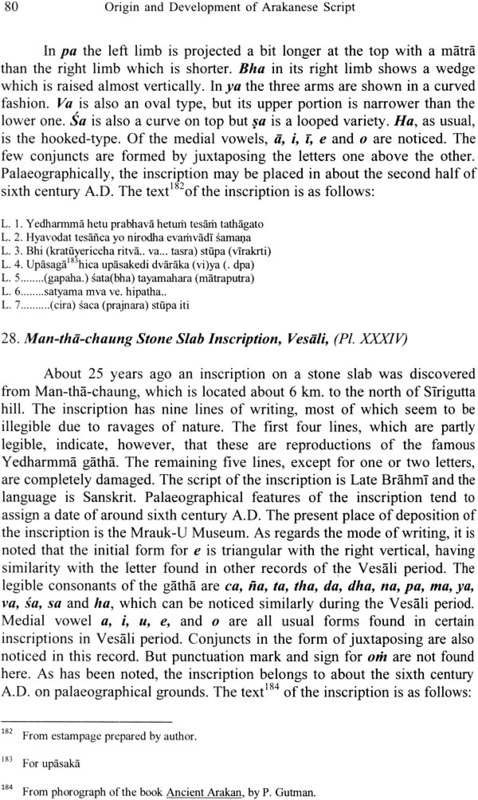 The concerned epigraph, known as the Fat Monk image inscription was discovered near the old Vesali city and contained one line inscription in Old Brahmi script and Pali language. Though descended from the same stock, worshipping the same faith and speaking the same language as Burmese, the Arakanese had witnessed the flowering of a distinct culture. They preserved a distinct dialect and also a distinct script throughout ages. Separated from Myanmar proper by a mountain range known as Rakhine Roma, Arakan possesses a rich heritage of its own. According to dependable old chronicles, it had an independent successive dynastic rule spanning for over five thousand years from around 3280 B.C. till its occupation by the Burmese King Bodawphaya in A.D. 1785. The immense regard that the Arakanese had for the Buddha and the religion propagated by him remained undiminished even to day. The existence of numerous pagodas and the great many Buddha images that adorn them unmistakably support this hypothesis. By virtue of its having a vast coast-line along the Bay of Bengal, it was at liberty to make friends with people living far and near, and take initiatives in fostering maritime trade and other economic activities, in sending delegation of monks to churches belonging to Ceylon and in cementing treaties through matrimonial alliances with one of the ruling houses in western part of Bengal. The script, used in Arakan at present, can in no way be separated from the letters used in Burmese. But in regard to pronunciation of a few letters, the Arakanese people can differentiate between the two. 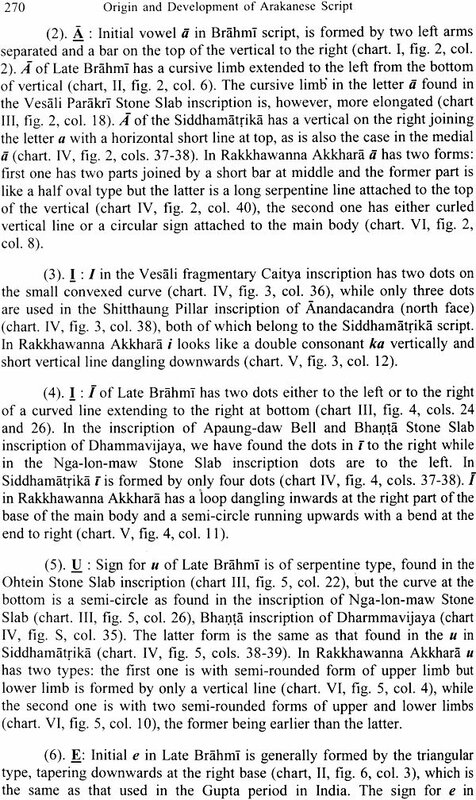 The language used in the Bodh Gaya inscription belonging to the Lemrot Period has been cited by a section of scholars as Burmese. But, because these scholars failed to make the differentiation, their interpretation of this inscription turned out to be defective. We have tried to make amends for this wrong explanation at the appropriate place. 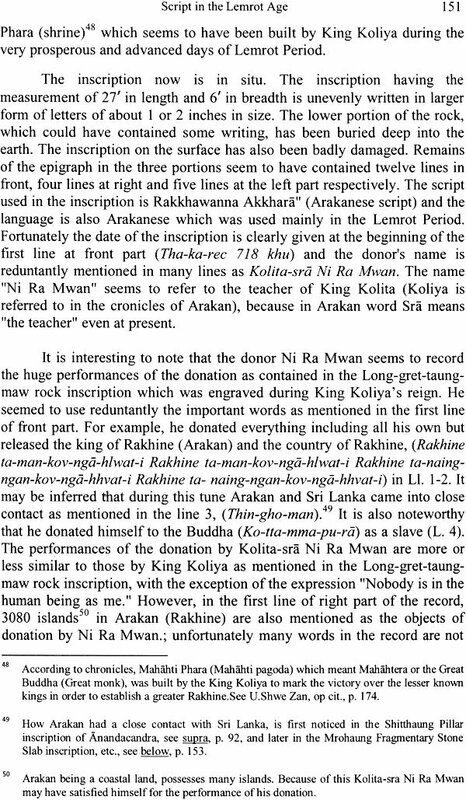 The contents of the early epigraphs would appear to be an eye-opener to those section of scholars who tend to think that the early Arakanese were a people who did not know anything except plundering, piracy, treachery, court-intrigues and a condition where all seemed to be in disarray. 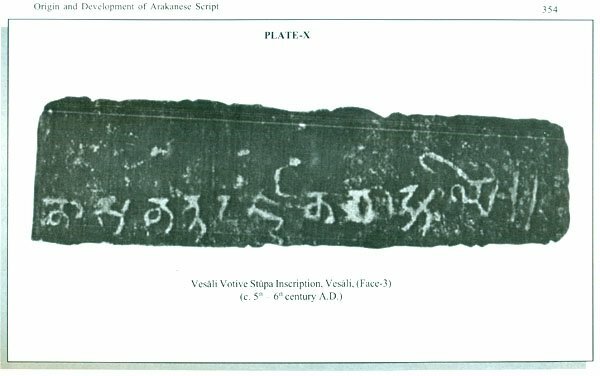 The early inscriptions, in contrast, give us a picture of the early Arakanese who were devoted and virtuous, who practised charity and who were, for all practical purposes, devoid of violent behaviour. 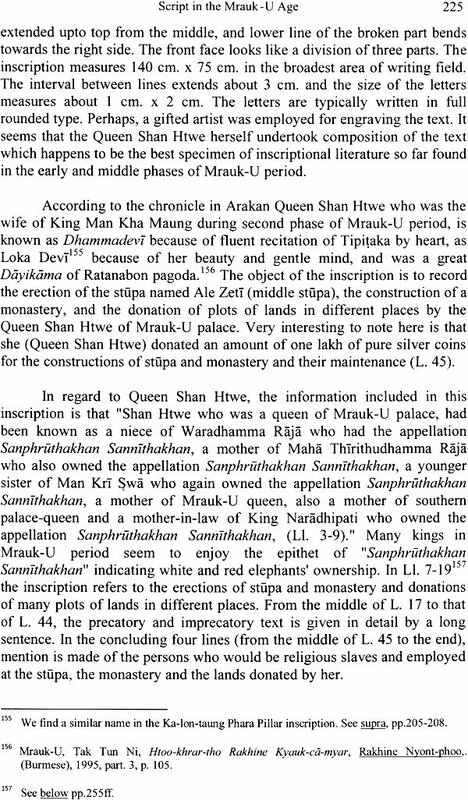 The early kings and queens were generous, fond of people; and they made friends with kings of distant countries or sent presents to people living further apart from Arakan. In later inscriptions a regular theme which recurs is donation of land to religious establishments. Along with were mentioned how the land could be utilized and how a section of people who would be in charge of donated plots of lands, would use them properly. Thus, apart from political event, early inscriptions give us an insight into the economic and religious condition of those days as well. 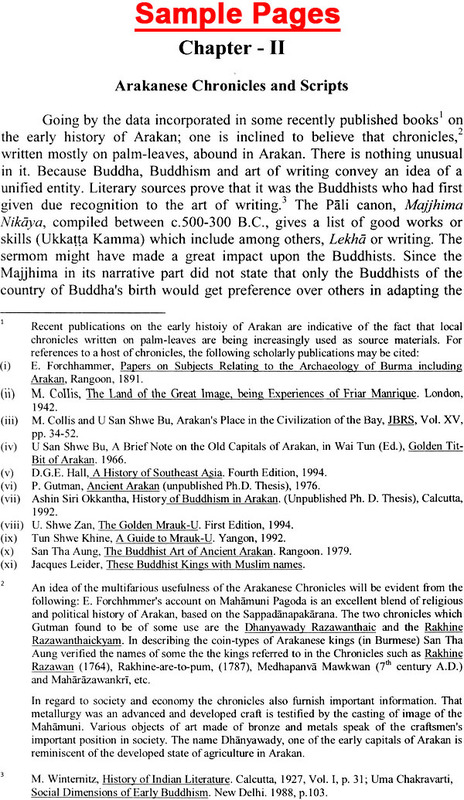 More importantly, from the point of view of its rich legacy, Arakan came to be inseparably linked with ancient Indian cultural heritage, imbibing, apart from one of the sublime religious paths that the world has ever seen, language, literature and, above all, the art of writing, to name only a few. Situated to the east of Samatata and Harikela, Arakan had a high standard of living, culture, script and art which flourished through ages. This is mainly due to its geographical position on the boundary of India on the one hand and Myanmar proper on the other hand, on the other side of the Roma.